Selling keychain lights and mini key lights on the internet for over 7 years! Use Any of These CARDS! $4.95 Flat Rate Shipping For Any Quantity! 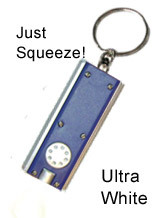 Quantities from 10 to 10,000 or more! 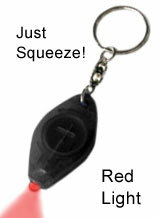 Bright, these can be seen for up to a mile and can last for years on your keychain. Each light comes with batteries. 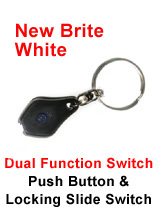 Colors include white as well as hard to get blue and red lights. School faculty in emergencies, lockdowns, etc. 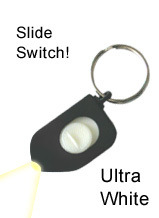 Everybody loves getting these mini LED keychain lights!! Special Flat Rate Custom Printing Offer - Only $19.95 on quanities of 100 or more! $19.95 Flat Rate Includes Set-up and Printing. Select Models only. Logo or text provided in a jpeg, gif, or png format. 1 color print on 1 side only. 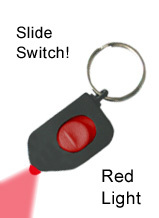 © Copyright 2002 - 2009 Keychain Lights Speicalies LLC. All rights reserved. Website created and maintained by Platinum Graphics.